It’s always hard to head for port knowing the boat will soon be out of the water and tucked away for another season. But it helps to have sunny days, a bit of wind, and cosy stops planned on your way out. This time, we crossed from Canada with not enough wind to sail but gorgeous skies and made for Friday Harbor to check back into the US–our first time in this busy San Juan hub. …but on a gorgeous day. We found tasty food and brews upon arrival and took some time the next day to poke in bookshops, marine stores, and the small but well-designed and interesting Whale Museum. We learned there that elephant seals had been spotted near Doe Bay–our final island stop–just a couple of days ahead of us, and we were eager to see if we would catch a glimpse of them. We had no luck for those seals, but when we paddled ashore from our mooring ball to Doe Bay Resort, we found one of the landing beaches had been closed: A harbor seal pup had been coming ashore and trying to climb the ramp to the main resort area. Apparently he was curious but molting and a bit grumpy. We’ve been making a habit of stopping at Orcas Island’s Doe Bay for our last night before returning to Bellingham and pulling the boat. We discovered the resort and its toasty soaking tubs, tasty food, and welcoming staff on our first adventure in the islands, and it’s the perfect place to soak off some of the traveling and prepare for a return to reality. We missed the seal pup when we arrived, but there were plenty of adult harbor seals, herons, and other birds to keep the camera in hand, along with a beautiful sunset and sunrise. That morning, after we returned from a final soak and brunch and prepared to pull our lines and take off, we spotted him cavorting in a small corner of the cove. 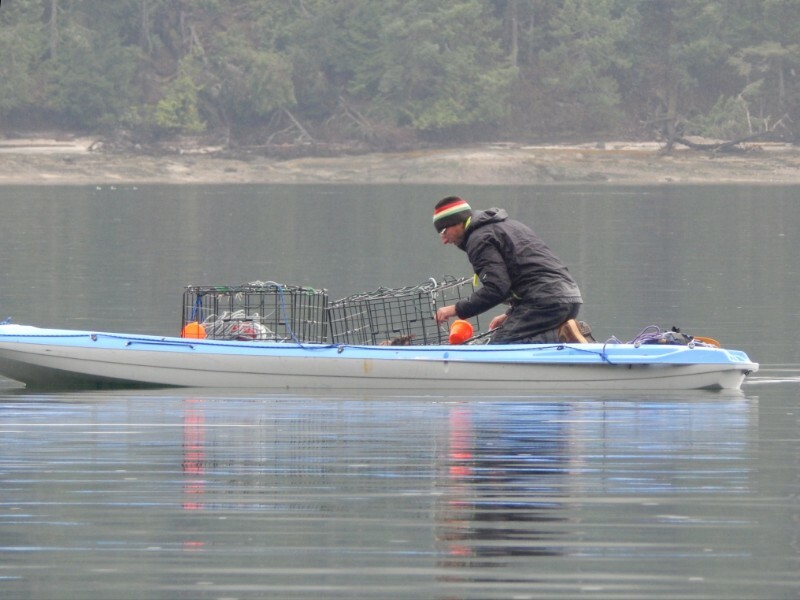 We immediately hopped back into the kayak so that George could ferry me near the cove for some photos, capturing not just the young seal but also a fishing mink as we floated back toward the Blue Mule. Harbor seal pup, showing off. It was an ideal end to our brief, relaxing time in Doe Bay, especially because we had our best sailing day of the trip returning from there to Bellingham, with big, steady wind that kept us heeled over the entire way. Mt. Baker was a clear as we’d ever seen, and the breeze died down just as we were heading into the marina. One final harbor seal popping up to check out the Blue Mule as we were loading her on the trailer. Perhaps he was welcoming us back. Or perhaps he was reminding us to return–whcih we surely will. You knew I wouldn’t be able to resist writing about food, right? We’ve been eating well as usual aboard the Blue Mule. But more rain and less wind on this trip means more adventures ashore in the Sea Goat to forage at the water’s edge and on land. On our first rainy passage, from Vancouver to Prevost, we saw proof that we weren’t the only sea foragers: a harbor seal caught a salmon and hurried to ingest it while fending off hungry seagulls. 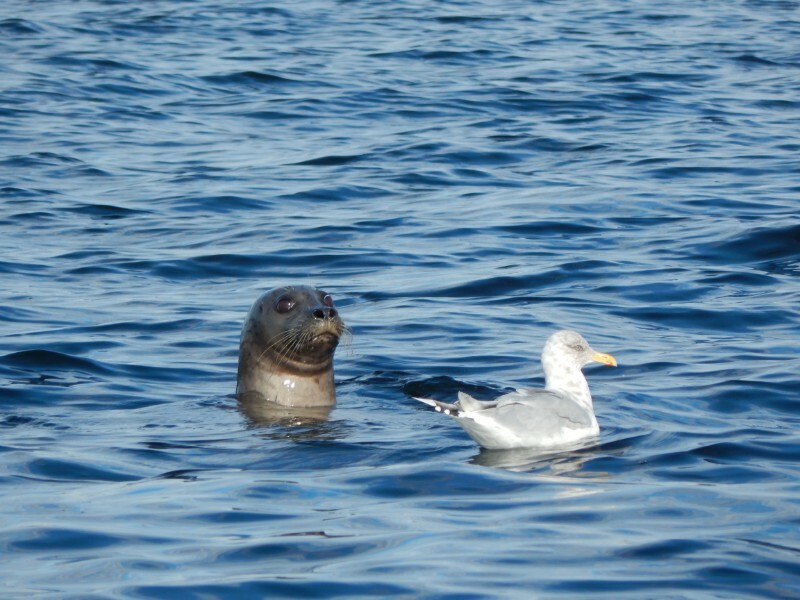 We’ve seen several feeding seals since. George has become pretty good at spotting the signs: a bit of splashing and thrashing around with a seagull stationed nearby. Some of our first foraging was at the Ganges Farmers’ Market. We returned to the Blue Mule with oyster mushrooms, strawberries, arugula, and other goodies from the Salt Spring purveyors. The original plan was grilled Thin-Crust Pizza, but we were sidetracked by the fisherman selling wild prawns straight from his boat. That night, we feasted on grilled prawns and oyster mushroom bruschetta instead. We put off pizza one more night after we discovered safe clam digging and oyster harvesting waters on the edge of James Bay. The parkland, like many in the San Juan and Gulf Islands, featured old orchards from its prior life as a homestead. We grabbed apples, pears, and chestnuts. We weren’t the only ones: black-tailed deer and a piliated woodpecker were busy harvesting as well. Our bounty led to another impromtu feast, this time featuring an improvised clam chowder. We found even better clam digging at Walker Hook, where the soft sand yielded up handfuls of clams in the first shovelful and a hole that could be widened just with our hands. Ripe pears were ready in the old orchard, and I collected a pocketful of wild rose hips. But George made the real find: a patch of Shaggy Mane mushrooms. We went to bed with bellies full of beer broth-steamed clams, sauted mushrooms, and grilled sourdough flatbread. Not bad for a foraged meal cooked in the open cockpit of a Venture 25. 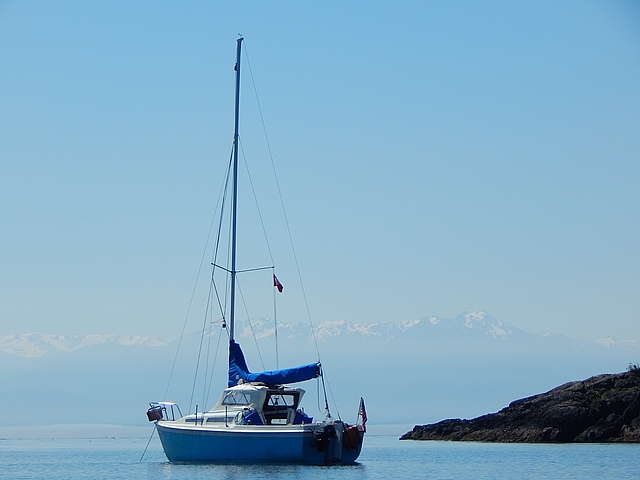 Our prior fall and spring sailing trips in the San Juans and Gulf Islands were driven by a surprising amount of wind and sunny skies. We’ve swung into wetter weather this trip. So there’s been plenty of cozy time in the Blue Mule and wetter trips in the Sea Goat, our kayak tender, to forage on shore–with Julie doing more of the former and George more of the latter. After the bit of rain mentioned in our last post, we made a quick run from Tsehum to Sidney, to pick up a shellfish license, and then had our first rainy crossing from Sidney to Prevost Island. We anchored quietly for the night behind Owl and Secret Islands, which protect Glenthorne Passage. As the weather bounced between rain and sun, we countinued bouncing between quiet anchorages and quick town stops: from Glenthorne to Ganges on Salt Spring for provisions and then back to Prevost for the night, this time in James Bay; from there to Montague Bay on Galiano; on to Wallace Island’s Conover Cove; and then up to the town of Chemainus for a quick cleanup. From there, we continued to our northernmost point and spent the night tucked behind the Dunsmuir Islands in Ladysmith Harbor. 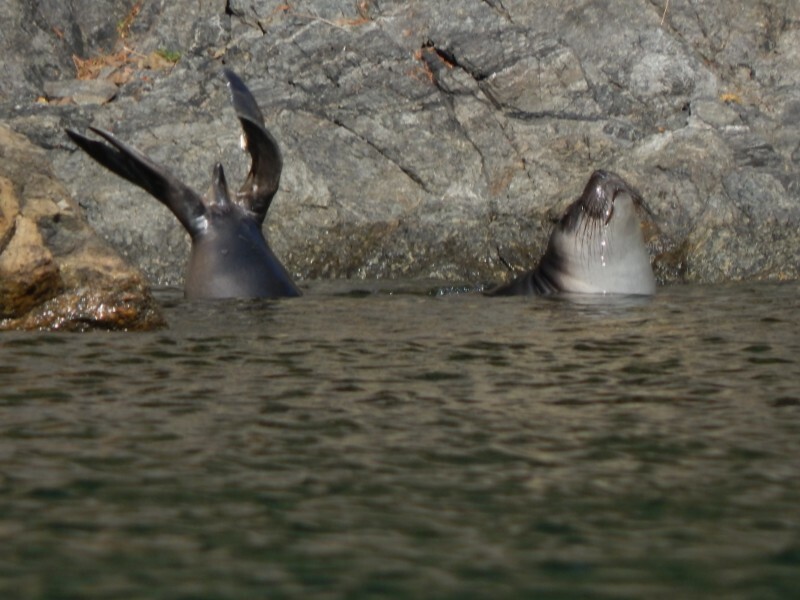 The wet weather settled in between James Bay and Conover Cove, keeping the wind out of our sails but giving plenty of chances to watch birds, seals, and sea lions make the most of the freshwater showers. As the weather cleared, the sun brought some wind with it, giving us a break from the motor. By evening, it tended to die down again, making for gorgeous sunsets and mornings and calm nights. We’ve turned south now, making some longer passages to return to Bellingham on schedule–although we couldn’t resist poking into Walker Hook to dig a pot of clams. Prevost seems to be our favorite destination: Every anchorage has been beautiful and quiet, with only a couple, if any, other boats. We’re back at the island for our third night, this time on the southern end in Divers Bay. Our cruise in and an evening paddle took us passed cormorants catching the last rays of sun and curious harbor seals while showing us some additional anchorages we may explore on a future trip. The ferries pass by regularly, but the deep bay means we’re just gently rocked to sleep by the boats’ wash.
We’re on our third Salish Sea adventure with the Blue Mule and unexpectedly found WiFi just a couple of days into our trip. So you get an early glimpse of our adventures. We got a slow start on our launch day, so we immediately changed our plans. We spent our first night in Inati Bay on Lummi Island, still looking back into Bellingham Bay but at least on the water. Then we pushed on all the way to Jones Island, a marine state park, coming over the top of Orcas Island with plenty of wind and just a bit of contrary current. It was a windy but gray day, so I left my camera on the boat when we went ashore for a quick walk to warm up our feet. That turned out to be a mistake: We encountered not just friendly black-tail deer, as noted in our cruising guides and on all the park signs, but also spotted a piebald one. (He seems to be elusive enough that I couldn’t even find a photo on someone else’s website.) Given the grayness of the day, we also didn’t expect a sunset–and couldn’t have been more wrong. My camera was in hand the next morning, as I alternated yoga with watching otters and herons. We went ashore again so that I could search for the piebald deer. I didn’t have any luck, but the friendly buck who claims the old orchard as his territory was thrilled to have George whack apples down from the highest branches. From Jones Island, we made our crossing into Canada, with less wind than we had hoped but plenty of opportunities to watch big boats. We arrived too late in the day to pick up a shellfish license, so we’re tucked into a corner of a marina in Tsehum Harbor–clearly still in the land of big boats. I’m pretty sure that boat is looming over George’s shoulder because it’s envious. The Blue Mule is on her trailer, and we’re bound for the West Coast today on our third launch into coastal waters. Ever since our return from Australia, we’ve been sailing the Blue Mule regularly on Flathead Lake—so regularly that we joined the North Flathead Yacht Club and have been keeping her in the water all summer. But last fall we decided she was ready for a bigger journey: out to the coast of Washington and beyond. It was the first time she’d been in saltwater since she was moved to Montana nearly 40 years ago. And she handled it beautifully. 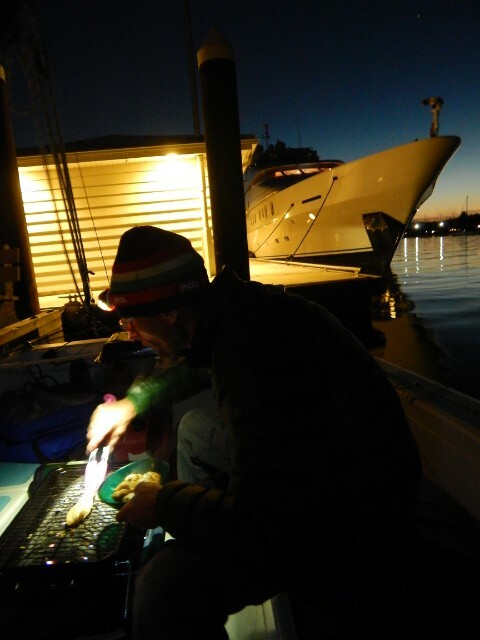 Julie’s family is now all in Bellingham, making that an easy launch point for our saltwater adventures. 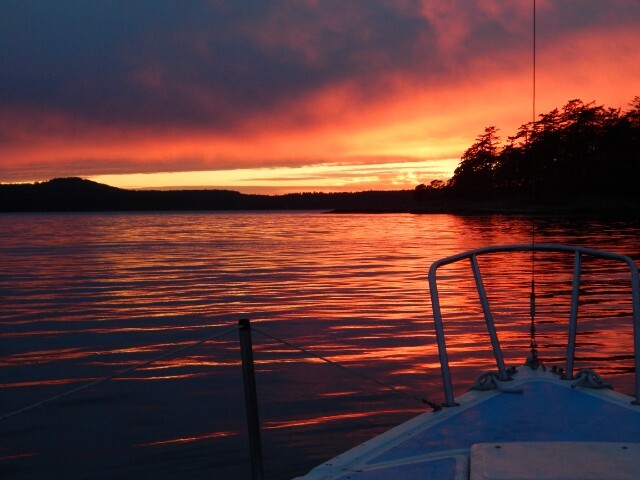 Last fall, we spent a long week sailing in the San Juan Islands, working our way around Orcas Island and visiting some of the islands on its perimeter. We were blessed with gorgeous weather and a surprising amount of wind. You can check out photos from that trip here. We had such a good time that we returned in the spring for a 2-week cruise. This time, we spent just a couple of nights at Lopez Island before making the crossing to Canada. We spent most of our time around Vancouver Island, with a good mix of city time, tourist time, and boat-only access. We just happened to be in Victoria for Victoria Day, adding boat parades, marching bands, and other festivities to our experience. We also continued what’s becoming a tradition of sailing to concerts, started with our friends Ben and Rachel when they invited us to sail on Soterion to hear the Jazz at Lincoln Center Orchestra in the U.S. Virgin Islands; this time, we sailed to hear Rufus Wainwright. While in Victoria, we had a chance to visit friends, and Julie taught her first international Twice as Tasty workshop. As you can imagine, we ate well, both on land and on the water; George caught his first crab in Canadian waters, and one evening we had an oyster feast thanks to Westcott Bay Shellfish Co., tying up the Sea Goat (our three-seat kayak tender) to her working dock and grabbing a bucketload of beauties to shuck on the Blue Mule. We discovered that Butchart Gardens has free moorage for visitors, so we arrived one evening, grabbed a ball, and scooted across to the back gate when the gardens opened in the morning. We rounded out the trip, as we did in the spring, with a soak at Doe Bay Resort. As we roll out of Montana today, our goal is to cross again into Canadian waters, this time heading to some less accessible Southern Gulf Islands and working our way up Trincomali Channel, perhaps as far as Nanaimo. We’ll be almost 2 weeks on the water, and we’re hoping for a repeat of last fall’s gorgeous weather—keep your fingers crossed for us! Earlier this month, I sailed the Blue Mule for the first time without George—an overnighter with friend and fellow sailor Alanna Strong to Wild Horse Island in Flathead Lake. We captured more of the amazing wildlife we saw on the island than the sailing itself, but we had a lovely calm night camping on the boat and a beautiful day of sailing. Ditch the Dog is back! I’ve been struggling to not just take but actually share photos of our latest sailing adventures, so it seems time to revive this space. I don’t really need another blog project, so expect things to end up sporadically on these pages. But we do hope you’ll follow along. The blog may have been on a hiatus, but we’ve been busy on the water and off. Here’s a brief overview of some of our adventures. After our return from our blue-water and Australia adventures, we focused on sailing closer to home—on Flathead Lake. We’ve joined the North Flathead Yacht Club and are keeping the Blue Mule in the water all summer, taking her out at least once a week with friends old and new. And we’re still crewing on other people’s boats for race nights and long-distance races. George has really stepped up his sailing time. 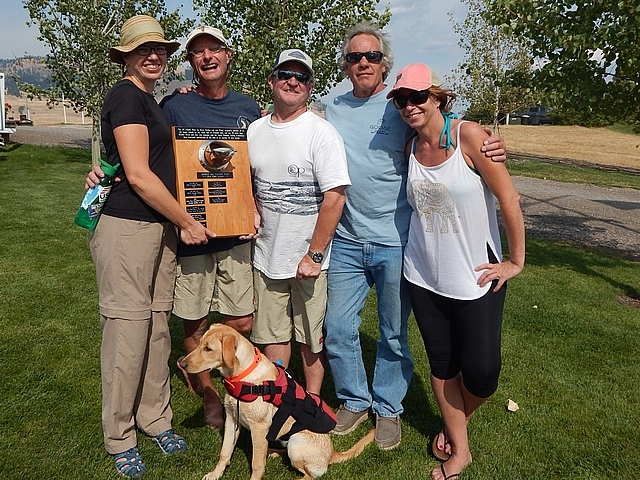 He spent 2 years as vice commodore of NFYC, running the racing program and organizing the annual Montana Cup regatta. He’s on the water almost daily in the summer: cruising, racing, and now teaching. George earned both his American Sailing Association instructor certification and his U.S. Coast Guard captain’s license. For the last 2 years, he’s been teaching through Flathead Lake Sailing School and offering a first-sail course through Flathead Valley Community College. Julie is still sailing often, but much of her summer time is spent in the garden and kitchen, making good food and teaching others to do the same through her food blog, Twice as Tasty. She recently launched a new phase of the project, offering her services as a private chef for house concerts, dinners, and other events through Twice as Tasty Live. She’s continuing to share new recipes on the blog weekly and to teach workshops locally and elsewhere in the United States and Canada. And makes really good food on the Blue Mule. Porter Dog is with us no longer. The dog being ditched as we traveled the world has ditched us; he passed on a couple of summers ago. He was a true pirate: stealing the best hunk of cheese, liberating dog toys, and engaging in debauchery with any untended dog bed or blanket. It seems fitting that we keep the blog’s name in his memory. Our sailing adventures are increasingly taking us beyond Flathead Lake. We’ve ventured a bit into warm waters, including the U.S. Virgin Islands. Our latest adventures have taken us to the Washington Coast and beyond. 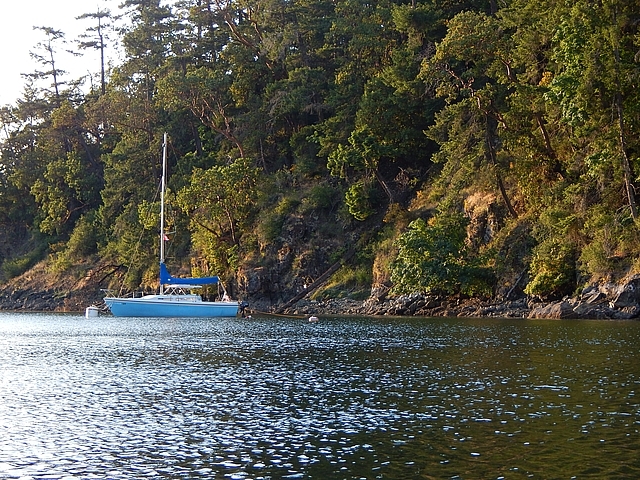 Last fall, the Blue Mule had her first saltwater launch since she arrived in Montana nearly 40 years ago, and we spent a long week cruising the San Juan Islands. It was such a fabulous trip that we hauled her out again last spring for 2 weeks around Vancouver Island; I’ll be sharing those photos here soon. And we’re heading back to the coast again next week, this time for 2 weeks in the Southern Gulf Islands. We’ll be sharing that adventure here! It’s been six months since we returned from our adventures in the South Pacific and Australia, so it seems well past time to put a cap on this page. Thanks to you all for joining us on our travels. Julie has posted her final poem–for now–from our adventures, but you can always check out more of her work by following The JulieBook. Don’t stop following this page, either—we are always dreaming of the next journey, and we’ll be sure to update here when we set off on our next adventure. Enter your email address to to follow this blog and receive an email when a new post is available. Flathead Lake Sailing School and Sailing Adventure Vacations Learn to sail and get your ASA certifications with George in Montana or the Caribbean. Twice as Tasty Julie's current food blog. Learn how to eat well year-round by preserving, pickling, freezing, dehydrating, fermenting, and more. The JulieBook Julie's poetry blog, now inactive but still full of good reads. S/V Nomad Newest live-aboard sailing friends who will be sailing around the world. SV "Submit" Cruising adventures with a Cal Cruising 36 on the U.S. East Coast and in the Bahamas. SV Chinook Montana friends who are now back in local waters after a family live-aboard adventure. 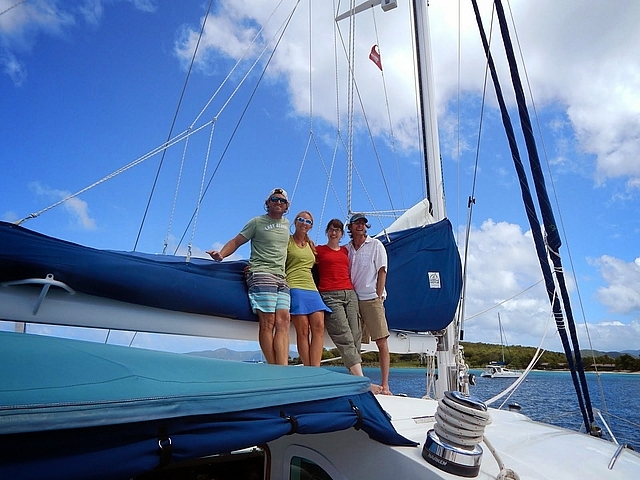 Soterion Book a catamaran charter with our friends Rachel and Ben for an amazing sailing and dining experience in the BVI. Find A Crew A great place to post extensive details about yourself and your desired trip. Dialogue is limited, though, unless you or the captain pay for the service. 7 Knots Freeform post space in a crewlist. Float Plan Very brief ads that you must email to submit, but traffic is good. Cruisers Forum You must join to view any post, but it's free. Cruiser Log Similar in design and graphics to Cruisers Forum, but this is a separate group. World Cruising Home of the ARC round-the-world rally. The Ocean Crew Link connects boat owners and crew. Couch Surfing Good not only for ride options and boat stays but also advice about islands from locals. Karaka’s Log Info about how to find a ride and be good crew.